Americans are facing a public health crisis brought on by the election of Donald Trump. The American Psychological Association reports that 63 percent of Americans say the current political climate and future of the nation is a significant source of stress. We are watching the degradation of the highest office of the land, diminishment of our leadership and standing in the world, blatant disregard for constitutional law, the attempted dismantlement of democratic norms and institutions, erosion of civil and minority rights, disintegration of the social safety net so many families rely upon, and living with the threat of nuclear war. We are drowning in our anger, frustration, fear, hopelessness, and anxiety. Many view the President of the United States as an existential threat. 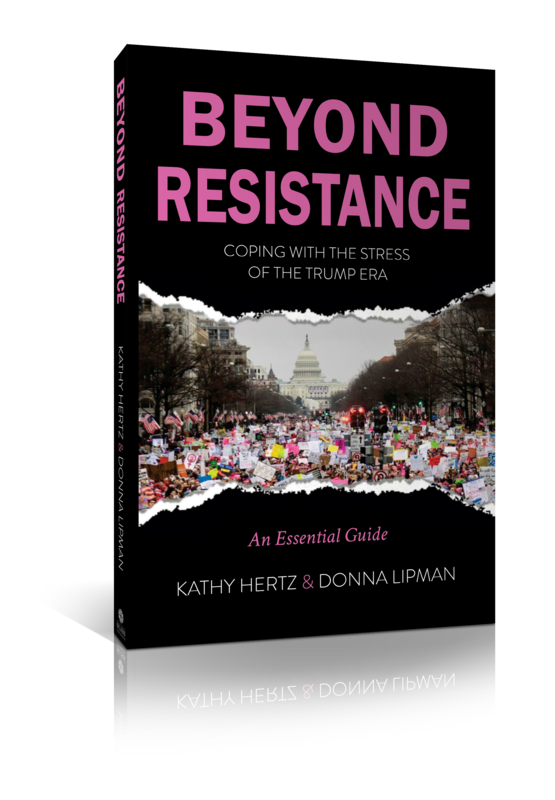 In Beyond Resistance, sought-after life coaches and committed Resistance members, Donna Lipman and Kathy Hertz, provide proven practical coaching tools and solutions specifically geared towards coping with “Trump-stress”. Through illuminating stories and exercises, readers are provided an in-depth understanding of why we are so polarized as a nation, how our subconscious plays into our stress-levels, and how to listen to and trust ourselves on a deeper level, all leading to reduced stress, greater self-empowerment, and ultimately, a more powerful Resistance movement. This is an essential guide for anyone struggling in today’s political climate. Beyond Resistance was originally written as a vehicle for life-coaches Donna Lipman and Kathy Hertz to manage their own emotional fallout after the election of Trump. If you are looking for a way to manage your Trump-stress in order to remain empowered in your political engagement, and navigating the current political and ideological turmoil. It’s about setting yourself free from the emotional upheaval but remaining committed to your beliefs and affecting change. Why Beyond Resistance? Resistance is a normal human reaction to things that feel threatening and can be an effective catalyst and motivator, however, it can ultimately inhibit and hold us back from creating what we want in the world. Resistance, outrage and the refusal to accept “what is” has created a powerful movement that has allowed us to see some of the best of what this country is about. But resistance, without conscious insight, will ultimately work against us.